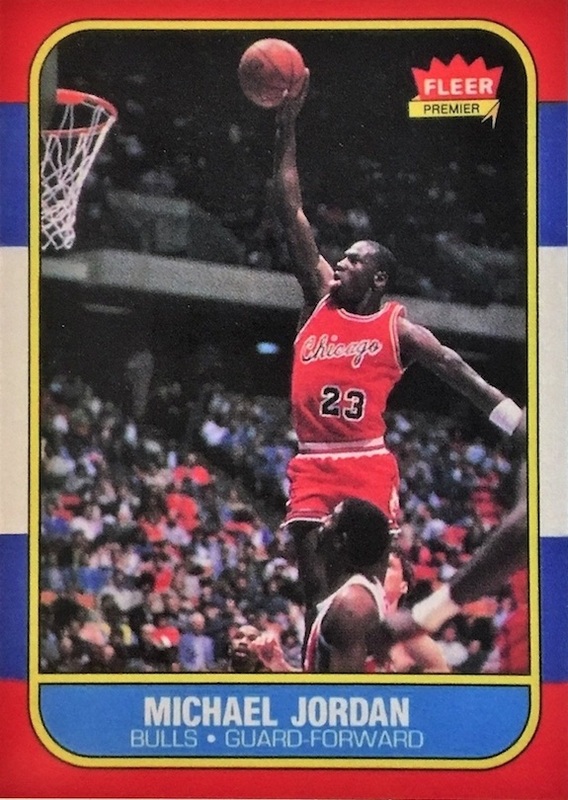 The 1986-87 Fleer Michael Jordan rookie card is one of the most sought-after cards in the entire hobby world. However, this did not happen overnight. A perfect storm of circumstances took the Jordan rookie from popular basketball card to iconic collectible. First, Michael Jordan is a superstar athlete that bridges old school and new school collectors. While new collectors might be aware of what previous greats, like Bill Russell or Wilt Chamberlain, have done, it is harder to appreciate their relevance due to low media exposure and the fact that they have not played basketball in so long. Beyond that, Michael Jordan is not simply a good basketball player. He is a worldwide celebrity with huge brand recognition and a legion of ravenous followers. Plus, there are those Nike shoes you may have heard of over the years. During the early 1980s, basketball cards were not that popular and 1986-87 Fleer was the first NBA product with full distribution since 1981-82 Topps. Although production numbers were not as large as other sports during the mid-to-late 80s, there are still many out there. Even today, the average collector with several hundred dollars and patience can still likely afford a low-grade Jordan rookie, while gem copies can push to the six-figure mark. Lastly, it is simply a good-looking card. The design has stood the test of time and it now defines that era of basketball cards. As the 1986-87 Fleer unopened case and box supply dries up, there is really only one direction for values to push. 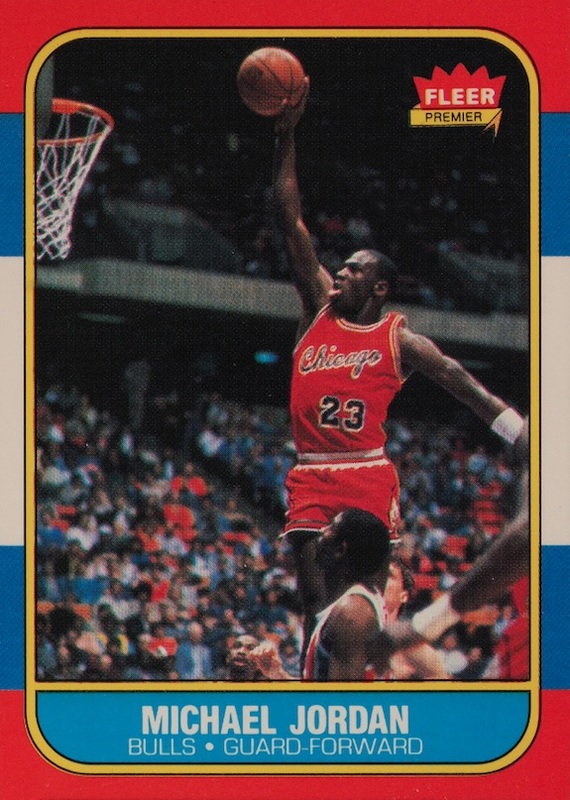 See Also: Ultimate Guide to Michael Jordan Rookie Cards. Unfortunately, this strong value and popularity resulted in an equally strong counterfeit market for Michael Jordan rookie cards. The wide variety in the quality of fakes can also cause problems. Some reprints are so grainy and poorly done, that even a less-knowledgeable collector would know something was wrong. However, there are some better quality fakes where only one or two things might be slightly off, and those are the most dangerous. We get a lot of emails and the "holy-grail Jordan rookie card finds" are normally not real. In general, if you stumble across a Michael Jordan rookie card in raw form, it is better to just assume it is fake but hold out a small sliver of hope that it is real. Then, attempt to identify any flaws or warning signs. It is worth pointing out that there are official reprints issued in later years by Fleer, including the Decade of Excellence MJ card from 1996 with added gold foil noting the 10-year anniversary. If you just check the print date, it is clear this is not the original rookie card. However, these are a great option if you can't justify the cost of a real rookie but don't want an outright fake version. As a guide to collectors, we have compiled some key areas to inspect in order to determine the authenticity of a Michael Jordan rookie card. While there are no guarantees, this can be a useful aid if you are on the fence about a purchase. To properly evaluate these areas, it is best to have a magnifier of some kind or at least images with high resolution. The most important things to remember are the two Cs: Clarity and Color. Collectors who prefer the safe route can eliminate the majority of the uncertainty by buying a Michael Jordan rookie card that has been authenticated and slabbed by a reputable grading service. These cards do come with a premium cost, that rises significantly based on condition, but you avoid the gnawing paranoia regarding the legitimacy of your purchase. The other route can result in considerably lower costs, but also the potential that you might have missed one red flag or that you just bought the nicest fake in town. Buy a professionally graded Michael Jordan rookie card on eBay. A quick glance at the images above shows how it can be confusing to decide whether a Michael Jordan rookie card is real or fake. While there are differences, even to the naked eye, only a very experienced collector could easily determine the authenticity of a Michael Jordan rookie card from a quick glance, especially if they are not able to inspect the cards in-hand. When looking at the front of the card, the first thing to pay attention to is the overall clarity. The clarity of the image, the clarity of the text, and the clarity of the colors. Sometimes, that is all it takes to immediately expose a fake. Just because this card is a few decades old, does not mean that the photo should showcase a slight haze, like the fake above. The text box at the bottom should feature cleanly printed text with a clear transition from the white text to the blue background, even under magnification. Also, under magnification, the thin black line that parallels the yellow border should be solid across the entire card and not pixelated at all. Another thing to note is that the red, white and blue background colors should not overlap at all. Less telling, but still useful, the "Chicago" text on Jordan's jersey should be crisp and every letter should be legible. Make a particular effort to inspect the "i" and the "o." The crown in the Fleer logo is another place to spend some time. Notice how much sharper the points are on the magnified authentic version. The "FLEER" text also has a more balloon-ish quality on the fake and "PREMIER" isn't crisp. The red, white and blue border on the real rookie card features distinct colors. Convincing fakes will normally be a tad brighter or darker, and poor fakes will exhibit colors that are much different. Another color element to look for is the arrow in the Fleer logo crown. The real version features a darker yellow/gold and is clearly a different color than the yellow text box. Many fakes will include the same color yellow in both the arrow and text box, but it is easy to trick yourself into thinking the colors are slightly different. The color difference is abundantly clear in an authentic version. The issues on the back are a little more subtle since there are fewer colors and images, and the design is plain. However, there are still several key areas to check out in regards to clarity and color. The first thing to check on the back of the card is the Chicago Bulls logo. With the real Bulls logo, you are able to see the white around the pupil, under magnification. On the fake, the ink around the eye bleeds together. There are several other things that can signify a fake card. One is the clarity of decimals in the stats, specifically the one in "27.2" average points. The decimal will be clear to the naked eye on the real version and nearly nonexistent on many of the fakes. Also, the decimals listed in field goal percentage are generally very faint on the fakes. Next, the © symbol on the bottom left, in front of "1986 FLEER CORP," should be clearly legible. Likewise, the ® symbol in the top right near the Fleer logo should be easily read. Lastly, the NBA Player logo in the bottom right should show a clear "NBA PLAYERS" in the middle of the ball, and "NATIONAL BASKETBALL PLAYERS ASSOCIATION," around the ball. Also, the logo itself is a basketball. With the real Michael Jordan rookie card, you should be able to see the faint lines that are indicative of a basketball. The fake version will normally have just a filled circle. Again, color plays an important role on the back of the card, but since the color can vary from fake to fake, and it's mostly just various shades of pink and red, it is not something you can specifically point to as a rule. 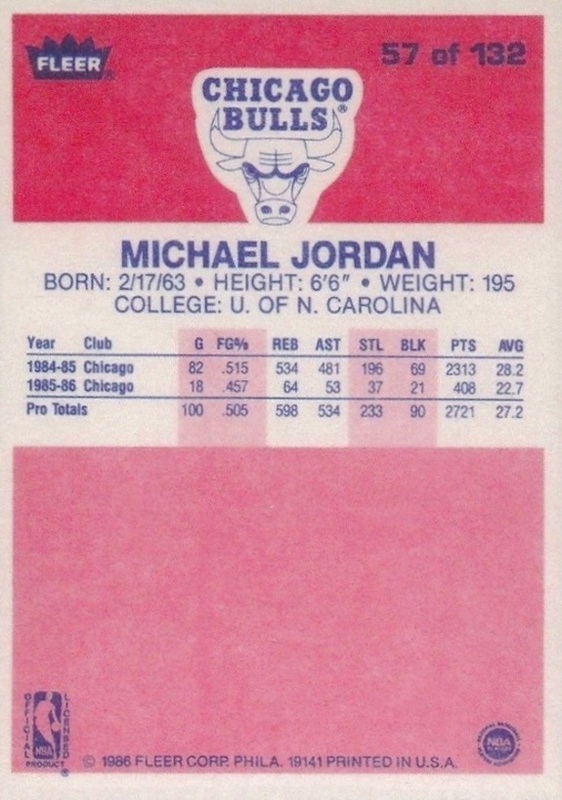 However, the back of the Michael Jordan rookie card that directly applies to color is the pink and red color blocks that take up the majority of the back. The real version appears more textured, while the fake looks more like a fully filled-in color. Also, the white background has more of an off-white appearance on the real version, while many of the fakes exhibit a brighter white color. Outside of these key areas, many people will suggest that you compare the card in question to a Michael Jordan rookie card that you know is authentic. And this is very good advice. But most collectors don't have Michael Jordan rookies lying around, let alone in their pocket, for comparison. It does help to know the feel of a particular card. I'm not suggesting you pry open the slab and play with a Michael Jordan rookie card, but is good to know exactly what you are dealing with. A good alternative to this is to buy a card of a no-name player from the 1986-87 Fleer Basketball set. Michael Jordan is really the only card with high counterfeit levels, and a common card can be had for a few dollars, depending on condition. This way, you know the stock, the weight, the gloss, the overall feel of the card. You will also have a good reference point for design comparison. "1986-87 Fleer Michael Jordan Rookie Card BGS 9"
MICHAEL JORDAN 1986 Fleer RC #57 PSA 8 NM-MT Near 50 50 God Bless the USA!! I went to my local thrift shop and found a MJ rookie card in a magnetic case for $10. I thought I found a gold mine. I was so excited I was calling my wife and trying to figure out if we should grade and sell it or keep it for our kids. Now, I have been collecting cards for 20 years and the thought that it was fake never crossed my mind, but it was and all it took was a trip to my local Hobby shop to figure it out. DJ at DJ sports card in Renton Wa. looked at it for 5 seconds and told me the horrible truth that is was fake. I found out that day, if it is good to be true it is. I’m having t oubl with my rookie card of Jordan #27/132. I’ve looked at your site but it don’t help me much. Is there anyway I can send you what my card looks like. I have a face book. I rarely check my mail. Patricia Rhoads from Owensboro KY is my profile. 270-903-5511 is my cell number. Please contact me asap. Have a blessed day. There is no decimal there! is this a typo of an authentic card or does this mean its fake? What is the difference between the original and the reprint? Haven’t been in the card market since 2001. I have a card that has the same photo as above on your Real/Fake example, except, the card has only a red border all around with MICHAEL JORDAN in white print. On the back it says MICHAEL JORDAN (CHICAGO BULLS) with stats from 84 thru 89. That’s it. no reference to a manufacturer name or reference number. I have searched and am unable to find this card anywhere. What do you think? Is it a fake or an Error? 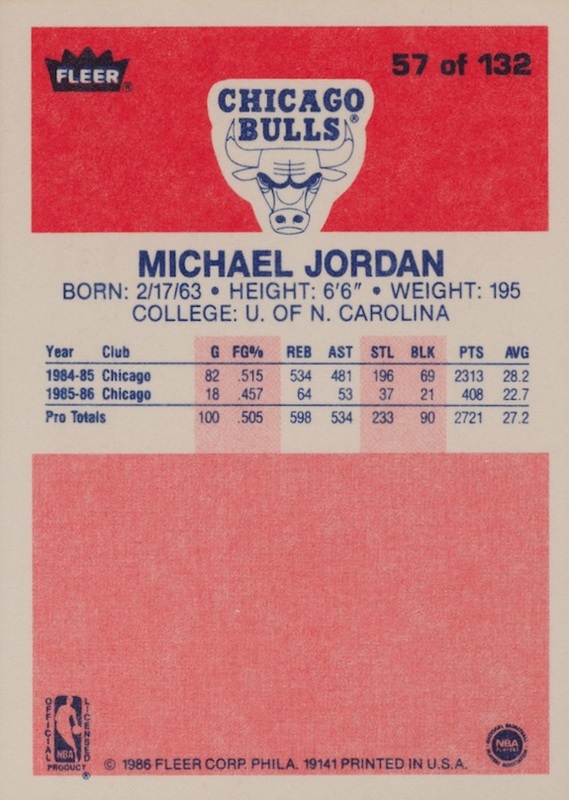 Also, if a Jordan card looks near perfect, then why would they not have had it graded as a bgs 9.5 or a possible bgs10. would pay off most cars. Before i read, if it looks too good to be true, it probably is. I have a Jordan rookie card I’ve had forever and I sent it in for grading to Beckett, cane back inconclusive. I believe it’s fake but it’s a very good one if it is. Again says inconclusive so what do I do now?